The receiver room of the GBT is filled with cutting-edge equipment used to detect, amplify, and digitize the weak natural radio signals received from space. Radio astronomers led the development of low-noise radio receivers that made possible the satellite communications industry. Image-processing techniques developed by astronomers now are part of the medical imaging systems that allow non-invasive examination of patients’ internal organs. At today’s observatories, the needs of astronomers for better instruments continue to drive developments in such diverse fields as electronics, mechanical engineering, and computer science. From innovations in microelectronics to the design of software that can process the data, the engineers of our Central Development Laboratory produce the specialized needs of this precise and demanding field of astronomy for us and customers around the world. We have two electronics labs: one in Charlottesville, Virginia and one in Socorro, New Mexico. 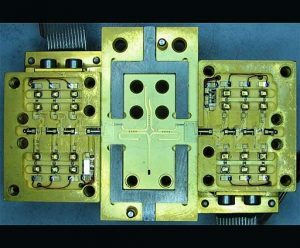 The NRAO Technology Center (NTC) in Charlottesville and the University of Virginia provide the high-precision miniature and plating needs of the smaller electronics. Socorro has a machine shop for constructing large-scale metal fittings. We design and build some of the most sensitive electronics in the world. The largest and most sophisticated radio telescopes on the Earth need our amplifiers and superconducting mixers to receive the extremely faint radio waves coming from the hearts of galaxies, baby suns and planets, and the complex interactions of atoms and molecules between the stars. Even spacecraft have benefitted from the use of our sensitive electronics. 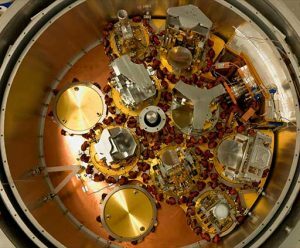 Amplifiers are critical and tiny components inside our radio telescopes on Earth and in space. They boost the weak power of natural radio waves (that arrive with about a billionth of a billionth the power of a cell phone signal). We deploy some of the largest, most precise radio telescopes in the world. The surface panels of the 100-meter Green Bank Telescope never stray from their shape beyond the thickness of a few sheets of paper, thanks to computer-controlled devices we helped design. To accurately combine observations between telescopes in the Atacama Large Millimeter/submillimeter Array (ALMA), we must know their exact separations from each other. Our instruments can measure, again to within one-tenth the thickness of a sheet of paper, the distances between telescopes as far as ten miles apart. We build large computers fast enough to process data coming from the world’s most powerful radio telescopes. Our petaflop-speed Correlator for ALMA performs 17 quadrillion operations a second, making it one of the fastest special-purpose supercomputers in the world. We machine, electroform, and electroplate flawless parts for our radio receivers. To collect weak radio waves from space with a minimal amount of lost data, our radio telescopes require extremely high precision parts. In addition to our sophisticated machining, we use electro-chemical techniques to grow the smoothest and most conductive parts of our telescopes’ instruments. 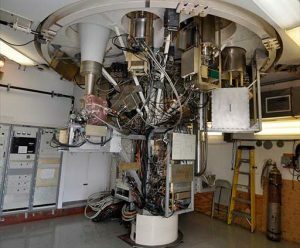 The ALMA Front End is the cryogenically-cooled container that houses the ten receivers of each of ALMA’s 66 radio antennas. We design supercooled radio receivers that operate at temperatures as low as four degrees above absolute zero. Radio waves from space arrive with one billionth of one billionth the power of a cell phone call. Noise from the telescope’s own electronics would drown the weak, space-based signals if we did not use these supercooling techniques. We program the latest video gaming hardware to process complex radio wave patterns naturally coming from objects in space, such as the superfast beams coming from rapidly spinning pulsars. And our software and data packages, such as CASA and Splatalogue, are used around the world.